Look at a diagram that defines soil profile. 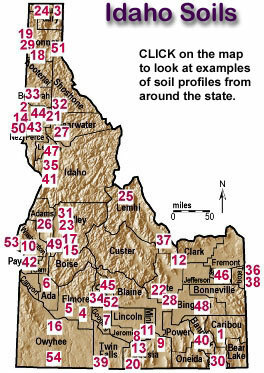 REVIEW an Idaho Soil Taxonomy Key for reference as you use the soils map. 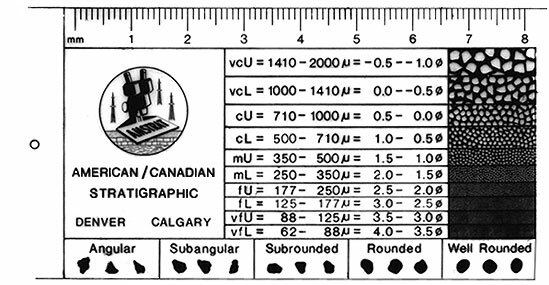 Click here to see what a grain size chart looks like. A small group of scientists in Russia developed a new concept revolutionizing soil science under the leadership of Dokuchaieva about a hundred years ago. They noted regular occurrences of vertically stratified, horizontal layers (horizons) in soil columns. The consortium concluded that a complete soil profile is the vertical section of horizontally layered, unconsolidated material down to the unaltered parent material. The horizontal layers develop naturally via a unique combination of soil-forming factors. The parent material is any material effected by its local environment while supporting plant life. Environmental factors include: 1) parent material, 2) climate, 3) topography, and 4) living organisms interacting dynamically through 5) time. Time is an important concept because soil profiles evolve, or mature, through time at rates dependent upon the other factors resulting in greatly varied characteristics and qualities of individual soil profiles worldwide. These genetic factors of soil formation are discussed separately. Geological events over a great period of time have provided Idaho with many different kinds of parent material. Each kind has contributed different characteristics to soils, physically as well as chemically. In many cases, soils have developed in two or more kinds of material, one on top of the other or mixed together. There are two general kinds of mineral parent materials - those that weathered in place from old rock formations (residuum) and those that were transported by wind, water, or ice. There are many rock formations in Idaho. They include granite, gneiss, schist, limestone, and basalt. These rock formations are most easily seen in the mountainous parts of the state. Basalt occurs in large plateaus and plains in the northern part of the state and in the Snake River plain of the southern part. All of these rocks have undergone various degrees of weathering. Parent materials moved by wind include sands and silts. Sands moved near the ground surface for relatively short distances. They appear mostly as dunes in rather small areas in southern Idaho along the Snake River and near Bonners Ferry in northern Idaho. Silt, with a small amount of very fine sand and clay, was carried longer distances. This is known as loess. Deposits of loess are extensive in northern Idaho, mostly on the Columbia River basalt plateaus, as well as large areas in the southern part of the state. In more moist areas some of the silts in the loess weathered to clay. Volcanic ash of various ages, from recent times (a few hundred years ago) to quite old (at least 3 million years), was also carried by wind and deposited as an important parent material in various parts of the state. Volcanic ash contrasts with most parent materials in being lightweight. Water has moved great quantities of material, in all parts of the state, providing a wide variety of, parent materials for soils. They grade from coarse materials, like sand, gravel, and cobblestones, where the water has moved fast to very fine materials, like silt and clay, where the water was still or moved slowly. These materials came from a wide variety of rock formations, which have influenced the physical and chemical properties of the soils. Glaciers provided yet another kind of mineral parent material. Large glaciers advanced several times into-, Idaho from Canada as far south as Coeur d'Alene during the Pleistocene age. Small glaciers also occurred locally in the higher mountains throughout the state. The ice deposited a mixture of various sizes of rock along with finer materials. Peat is a special kind of parent material that forms into organic soils. Organic soils mostly occur in bogs north of Coeur d'Alene and in parts of eastern Idaho. They may contain minor amounts of mineral material deposited by floods or wind. These parent materials were subject to the other factors of soil formation - climate and living organisms modified by topography over a period of time. Actually, all the soil-forming factors are working at the same time with different rates of speed or efficiency. They constantly interact with one another. Even a casual observer readily notes that there are many contrasting climates in Idaho. Precipitation ranges from about 8 inches per year with very little snow along the Snake River south of Boise, to over 60 inches with many feet of snowfall in the higher elevations of northern Idaho. Great changes of temperature and frost-free days per year also occur. In some places, the climate changes within very short distances. This is especially true with an abrupt rise in elevation in the mountains. Also the climate of a steep north slope can differ markedly from a nearby steep south slope. This is most noticeable in the canyons along the Snake and Salmon Rivers where north-facing slopes are more moist and cooler than south-facing slopes. What is it about climate that affects the formation and character of soils? There are direct as well as indirect effects. The amount of water that moves into and through a soil affects the rate at which weathering takes place. In the total absence of water, such as on the moon, this simply doesn't happen. Water puts into solution many materials, such as compounds of potassium, sodium, calcium, magnesium, and silicon. The more water available, especially in a soil material that allows water to move easily, the more these compounds are removed from the soil. This can be seen in several of the soil profile pictures. Calcium carbonate is light colored. In soils having limited rainfall it has been moved by water from surface soil horizons into deeper layers. This is a common feature of many soils in the Snake River plain area and near Lewiston. With more annual precipitation, calcium carbonate is washed completely out of the soil. Different chemical changes take place within soils influenced by the amount of water present and the soil temperature. With a state as varied as Idaho in precipitation and temperature, there are wide differences in soils. In general the drier parts of the state have higher ranges of soil reaction or pH. Most of these soils are neutral to strongly alkaline. In the more moist areas, pH values range from neutral to strongly acid. Availability of most plant nutrients is generally related to pH. Extremes of acidity or alkalinity adversely affect this availability. Soils with an excess of moisture like those with fluctuating water tables are affected in yet another way. They are nearly always mottled with various shades of gray, brown, and yellow. Soils with mottles are saturated with water at some time of the year. Such soils in Idaho are usually in low-lying positions. Water is also responsible for moving clay downward into lower soil horizons. Clay that has lodged in these horizons can be seen by using a hand lens. It appears as clay films, which resemble candle wax drippings. All the soil horizons having a lower case "t", such as Bt, have these clay films. Chemical processes occur much more rapidly under high temperatures than under low temperatures. Alternate wetting and drying of soils can also affect chemical changes as well as physically mix soil materials, especially soils high in clay. In addition, freezing and thawing mixes soil materials. Climate has an indirect effect on soil development. It influences to a large extent the kind and amount of vegetation. Many geologic processes contributed to giving Idaho its many different landscapes. Topography, or lay of the land, is an important soil-forming factor. Hill-slope angles determine the thickness of soil profiles, which vary from hillcrest to hill-bottom; and the degrees of natural soil erosion alluvium deposition. If topography becomes too steep, then it may become unstable creating land or rockslides. Finally, topography affects soil formation by effecting local climate creating a microclimate, thus dynamically interacting with another variable. Flat valley floors have slow to very slow runoff yielding moderately well to poorly drained soils. Little soil erosion takes place because the water does not move fast enough to pick up and transport sediment. In fact, the slow water velocities may cause sediment to fall out creating aggrading river segments. The valley floor also receives massive horizontally continuous layers of new parent material during periodic floods. These positions also have lower temperatures than adjacent uplands due to cold air drainage. As the slope increases, there are progressive changes. Runoff is increased. Soil is lost by erosion rather than being accumulated. The soils become better drained. Air drainage is improved. All of these things are intensified with continued steepening of the slope. Soils on very steep slopes erode not only by water runoff, but also by soil actually creeping or rapidly sliding downslope. Larger fragments of gravel, cobblestones, and stones periodically roll down hill. Soils on very steep slopes commonly are either very shallow or contain a high percentage of rock fragments. The direction in which slopes face in Idaho's latitude affects the local climate. This in turn affects soil development. Soils with south-facing slopes are significantly warmer and dry out faster than soils on nearby north-facing slopes. Strongly contrasting plant communities exist on north slopes compared to south slopes. The particular shape and position of slopes also affects water runoff. Convex slopes contrast with concave slopes. Convex ridge positions disperse water more uniformly than do concave sloping areas which concentrate water causing greater runoff and erosion. Plants and animals, including man, affect the natural development of soils. Different kinds of vegetation incorporate varying amounts and kinds of residue into the soil. This residue of leaves, needles, stems, and roots are converted to organic matter by the many microorganisms present in the soil. The soil horizons most affected are near the surface where most of the residue occurs. Generally in the temperate climate of Idaho, dark colored soils have more organic matter than light colored soils. There is a wide assortment of natural plant communities or habitat types, in Idaho. In the driest and warmest part south of Boise, the vegetation is relatively sparse. The natural level of organic matter is low - well below 1 percent. The soils are light colored. With a rise in precipitation and decrease in temperature, the vegetation becomes more abundant, and the organic matter in the soils increases. This reaches the highest level under dense grasses that once covered the prairie near Grangeville. Organic matter in the black soils of this area was nearly 10 percent. With further increases in precipitation and cooler temperatures, coniferous forests begin. There are fewer grasses and forbs under the trees, which provide a low amount of organic material. Soils are more strongly leached; lighter colored, and contain less organic matter. At higher elevations, however, the surface soil horizons are darker colored and are high in organic matter. Colder temperatures at these elevations retard the decomposition of organic matter. Microorganisms are present in all soils in varying amounts. When organic residue from plants and animals is provided, their numbers rise spectacularly. These tiny organisms are largely responsible for the decomposition of organic material. Larger organisms are also present such as insects, worms, rodents, and other burrowing animals. They contribute to the decomposition of organic material as well as generally mix the soil. Man has contributed to the present nature of soils in dramatic ways. Clearing the forests for cultivation has permanently changed the natural soil temperature and the rate of water runoff. Breaking out the natural prairies and clearing the forests for cultivation has mixed the surface soil and has in many places allowed great quantities of soil to be eroded. Soils are no longer as deep and the surface soils are lower in organic matter and have poor tilth. Many soils in the Snake River plain of southern Idaho have been leveled for more efficient surface irrigation. Some soils have been cut (soil removed) while others have been filled (soil deposited). Last, but equally important, is the effect of time on the formation of soils. Time is required for all things to happen. Time is merely relative, however, when understanding its effect on soil development. It is not just the number of years that has passed but the intensity of the soil forming processes during a given period of time that determines soil development. For example, a parent material available for soil development in a dry cold climate with sparse vegetation would develop exceedingly slow. In fact, not much would ever happen. The same kind of parent material in a warm moist climate with abundant vegetation would develop at a much faster rate. The question which is often asked about how long does it take to make an inch of topsoil has many answers. The minimum time required is believed to be many hundreds of years. Development of a soil generally reflects its age. A soil is considered to be "young" if its soil horizons are weakly expressed. The soil may have some accumulation of organic matter in the surface layer and only very weak development of a B-horizon or none at all. A soil is "old" if its soil horizons are well developed. An example of an "old" or older soil would be one showing evidence of clay movement from a surface horizon into the subsoil. It is easy to understand why there are so many different soils in Idaho, even within each county. There are seemingly an endless variety of significantly different combinations of the five soil forming factors. It is the combined effects of a particular set of these genetic factors that result in a "soil". Every living thing on earth depends on six inches of topsoil. Destruction of this easily damaged resource can turn lush farmland into desert. We can look around the world and see examples of this. The lack of rain south of the Sahara Desert in Africa is causing the desert to edge farther south by more than one foot per year. This may not seem like much but the desert stretches for thousands of miles. This means many square miles of farmland become useless each year. We look at the Sahara and think, "Well, that is far away." Sometimes it happens closer to us. In the 1930s the land in the Great Plains of the United States was overfarmed. Then a drought, or lack of rainfall, occurred. Because of the lack of rainfall and intense farming, the winds blew the topsoil away. The area became known as the "dust bowl." More than 50 years later, the land in the dust bowl has not fully recovered. Soil in Idaho is sometimes lost in other ways. One way is erosion. This is when the water or sand wears away the topsoil. Sometimes humans erode the soil. Open mining of phosphates could cause soil erosion. The top layers of soil are scraped off exposing the phosphate. Lumber companies in some areas of the nation at one time cut so many trees that the topsoil was exposed to rushing water. This eroded the soil. Today, measures are taken to protect the topsoil. Phosphate mining companies save the topsoil and replace it after the phosphate is mined. Lumber companies now plant more trees than are cut. This helps protect the soil, which is the basis for Idaho's largest industry, agriculture or farming. The soil is where the plants that provide us with food, fiber and shelter grow. Idaho has several types of soil. They can be grouped into seven major types based on features of the soil, the natural vegetation, the type of land where they are found and for what they can be used. Much of the area of the Snake River Plain is covered with a naturally dry, limy soil. This is found in a very thin layer less than six inches thick. It is made up of a mixture of wind-blown soil and volcanic ash. Most of the 3.5 million acres of irrigated land in Idaho is of this type and more than half of the field crops produced in Idaho are from this soil. The ash from volcanic explosions over millions of years has mixed with the soil to produce a soil well-suited for the growth of crops such as potatoes, wheat, corn, barley, sugar beets and alfalfa. Along the edges of this area is another type of soil that is similar. This soil is a darker soil and contains soil deposited by water and other types of minerals as well as the wind-blown and volcanic materials. Another deeper soil, with more clay, is also found along the edges of the plain where there is more rainfall. Many crops can be grown in this area without irrigation. Some of the mountain valleys contain a dark, naturally moist soil that was formed by the action of glaciers breaking up rocks as well as by dirt deposited by flowing water. The deeper areas of this soil are used to grow grains and hay and the more shallow soil is used for the grazing of livestock. In the forested areas of the state the soil is made up mostly of decaying plant matter mixed with a variety of rocks. This soil, while suitable for growing trees, is much too thin for the growth of many other types of crops. Even in the mountain valleys where farming takes place, the main crops are alfalfa for feed and grains such as wheat and barley. Care must be taken by lumber companies to protect the soil after cutting trees so new forest growth can take place. In the higher areas a similar soil is found. It is mixed with rocks and matted with roots of grasses and shrubs that grow above timberline. One other type of soil in Idaho is a dark-colored very wet soil found in some river basins. When drained, this soil will grow almost any crop that weather will allow. Undrained areas are used for pasture for livestock or waterfowl wildlife areas. The Idaho Overview modules were created by Digital Atlas staff members Jacqueline Harvey, Vita Taube and Diana Boyack. Please E-MAIL the Digital Atlas with any comments, concerns, suggestions or corrections. During Phase 2 of Digital Atlas development, detailed soil sample location and profile information will be added to each soil linked in the map above.